Home Sheducation Centre Sheds of all Shapes and Sizes: What are Our Most Popular Sheds? Sheds of all Shapes and Sizes: What are Our Most Popular Sheds? We have erected a lot of sheds in Perth. Often, we are asked what are our most popular sheds. The answer isn’t easy, because there are quite a few that are extremely popular. Sometimes we get a “run” on one kind of shed, and sometimes another. Sometimes we get more individuals, and sometimes we get more businesses that need sheds. The bottom line is that we can’t really rate one shed as being the most popular, but we can list a few of our most popular sheds. Here are our most popular, “in-demand” sheds. Perth area residents can’t seem to get enough of garages. They are a nice way to protect your car, not only from weather, but from thieves. They also provide a little bit of storage, and many people choose to buy a garage wide enough for two cars, storing the car in one side and using the other side as a workshop or storage shed. Some of the choices include the Single Roller Door Lock Up Garage, the Double Roller Door Lock Up Garage, the Triple Garage, and the Sliding Door Garage. Not only are these garages great for domestic use, but the larger models are great for farms and industrial use, too. Workshop sheds are quite popular, befitting their status as an Australian icon. Workshop sheds are a great place to while away the hours, working on projects or nothing at all. Most workshops have a bench on one side, and storage for tools on the other. A workshop with two roller doors or two sliding doors can be used as a combination garage and workshop, with the car on one side and the tools and bench on the other. Many also use a workshop shed as a combination workshop and storage shed. Our workshops come in four different basic designs: Single Roller Door Lock Up, Double Roller Door Lock Up, Sliding Door, and Workshop with Awning. All can be customised to your preferred size. Barns are also popular, not as much inside of Perth, but in the suburbs and outlying areas. Building a traditional barn costs a lot of money and takes a lot of time. It is much easier to buy a barn that has already been made and just needs to be erected on your property. Our barns are ShedSafe approved, which means that they have been built to the most stringent standards in the industry. We provide a ten year warranty on the structure, and fifteen years on the cladding. You don’t even have to worry about painting an Action Sheds Australia barn. All you have to do is visit our 3D Colour-Picker and select a colour for each of eight different elements on your barn. When the barn arrives, it will already be in the colours you have chosen. You won’t have to paint it again, either. We offer both American Design and Australian Design barns, and offer some great options, such as a breezeway on the American Design barns. Both designs offer mezzanine floors, internal walls, stables, skylights, awnings, and personal access doors. We also have a full range of industrial and commercial sheds. Many businesses have found that our sheds save them thousands of dollars, and a few extremely large accounts have saved millions of dollars from what a traditional suite of brick and mortar buildings would cost. Our basic designs include the Miner, the Contractor, and the Jackson. All include ten ton gantry beams and walls made of ColorBond steel. Other features include U beam columns, rafters, bridging, purlins, bracing, electric roller shutters, and more than we can possibly list here. 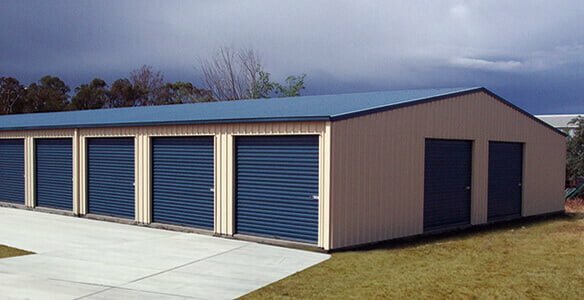 Our commercial sheds are usually used as factory, office, or warehouse space. Due to the magic of cladding, we can make an office shed look like a state of the art office building. Warehouse space is usually allowed to retain its original appearance. We construct our commercial sheds with the same strength that we do our industrial sheds. Optional features include roller doors, dividing walls, personal access doors, skylights, windows, wall cladding, and more. While these are our most popular sheds, you really can’t go wrong with anything in our inventory. We have sheds for every conceivable purpose, and they always save time and money over traditional bricks and mortar construction. We offer a ten year warranty on the structure of all of our sheds, while the cladding carries a warranty of fifteen years. In addition, all of our sheds are ShedSafe approved, which is the highest honour in the industry. Call 1300 778 628 today.